In this world, with all its pressures and drive to succeed, it is easy to seek the approval of man. After all, if we really want to get ahead at work, have a happy marriage, have well-contented children, keep friends, etc. don't we have to work at making them happy? As Christians we need to seek the wisdom of God, and not worldly wisdom as we work at sorting out and balancing these things. Have you ever wondered why Jesus did not allow the devils to speak? They knew who He was. A few verses before a devil had identified Him as the “Holy One of God.” If Jesus was seeking to establish who He was, why not take all the witnesses possible? A few verses later Jesus even commanded a man He had healed not to talk about it. 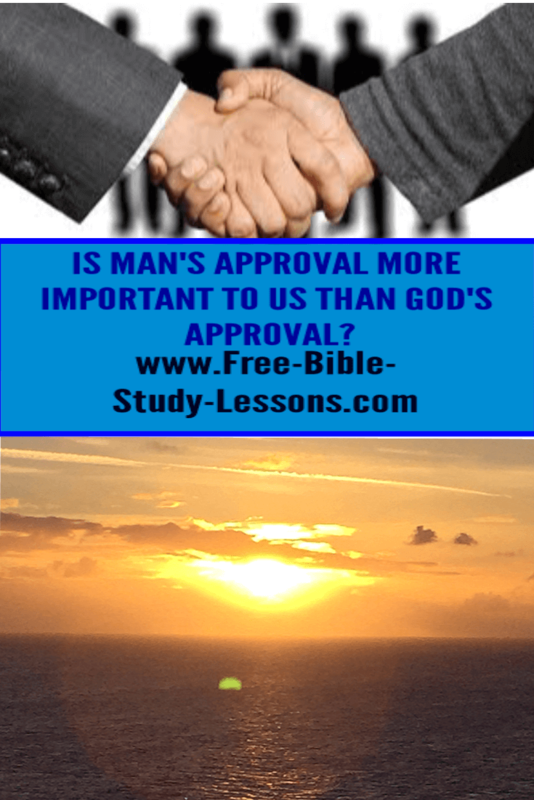 Jesus obviously was not seeking the acknowledgement or approval of man. We are often anxious to prove who we are and have others recognize what God has done or is doing in our lives. When we do that we are taking the glory from God and placing ourselves at the center of attention. Jesus refused to do that. He knew Who He was and what He had do to. Because He had confidence in God, He did not need to seek the approval of man. The devils were offering Him a temptation to push Himself forward, to jump ahead of the purposes of God, to gratify His ego, to be successful in the eyes of the world. How many times are we willing to compromise our integrity because we want the approval of man and we don’t care where it comes from. The temptation has power when we lack confidence in God. When we are not sure God has really called us, or we can’t wait for His timing, or our own goals have clouded God’s goals, then we want to solve the problem ourselves. Those who grasp for power or position are usually those least able and qualified to have it. They will find themselves compromising principles and Christian character in order to have the approval of man which is necessary to keep a position they have fought for. Jesus was perfectly content to have God establish Him. He did not need to desperately claw at every opportunity to be known as the Son of God. He did not have to shout, “Look here I am, the Son of God, the Messiah, even the devils know Me!” When we know who we are, we are not anxious if others recognize it or not. David is a beautiful example of this. As a young boy, David was anointed king of Israel by the great prophet Samuel himself. There was no mistaking the call. Yet David never grasp for the position. He served and respected the current king. He was faithful and true even though Saul tried to kill him. When David was given to opportunity to kill Saul and take the kingdom by force, he refused. He knew that God’s word could not fail and that in the right time God would place him on the throne. If God places us in a position, then He will keep us there. If we fight, struggle, and politic our way into position then we will have to fight, struggle, and politic to stay there. It is much better to wait on God and be available for what He has in mind for our lives. Great men and women of God are often, at least at first, not recognized as great by their peers. But God is looking for the humble and submission person, the one He can trust. Is that you? For more information about Glenn Davis see our About Glenn page and/or his Author's Page on Amazon. How far could you go with a Bible School in your pocket? The School Of The Spirit offers courses on everything from learning to hear God for yourself to improving your physical health. Take online courses and grow your life. Invest in yourself today. Check it out here. Note: If you purchase a course, I will make a commission. See our Disclosure Policy. Would you like to see what we have written on a subject? Use the search below. Or you may want to sponsor a page on a monthly basis. This can be a good way to promote a business, charity or for an individual to receive recognition for a page they particularly like. Click here for details. Read author Glenn Davis’s latest fiction book set in the El Empire: Sandy’s faith and courage are put to the extreme test as she must convince others that they have an imposter in charge of the U.A.F. Gallant starship and the 100,000 people onboard. What evil scheme does this man have? What has he done with the real Captain Danson? Danger lurks around every corner as Sandy and her friends race to unravel this mystery and expose a plot that endangers the life of everyone onboard.